a pretty Mercury glass star which goes so nicely with the other silvered ornaments. 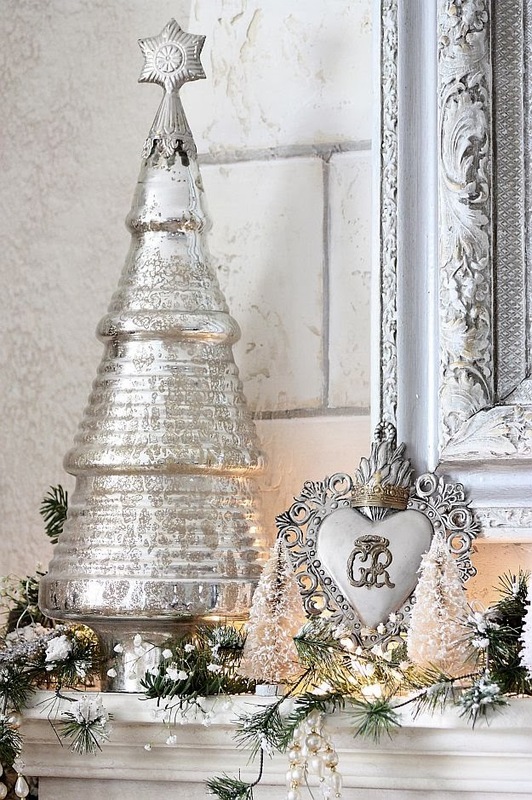 The living room mantel is dressed in the same white and silver as the tree. The large Mercury glass tree is displayed here with the addition of a silver ex voto. What a pretty mix with the simple and delightful bleached bottle brush trees along the greens that have faux snow, and some more baby's breath. I wrote a tutorial on bleaching the bottle brush trees HERE if you would like to try it yourself. This lovely ex voto is a replica of older ones, and has a mild patina and features a combination of aged gold and silver. It's a wonderful complement to the other silver and Mercury glass pieces as well as the Madonna and Child art above the mantel. The Madonna and Child art print is shown in the perfectly imperfect frame that was painted with Annie Sloan Chalk Paints. 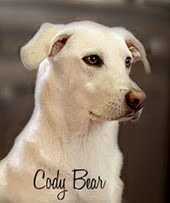 You can see what it looked like before and after HERE and the step by step to creating the look. One thing that changed since then is that I added a metallic silver, gray glaze to the strip between the caved areas. 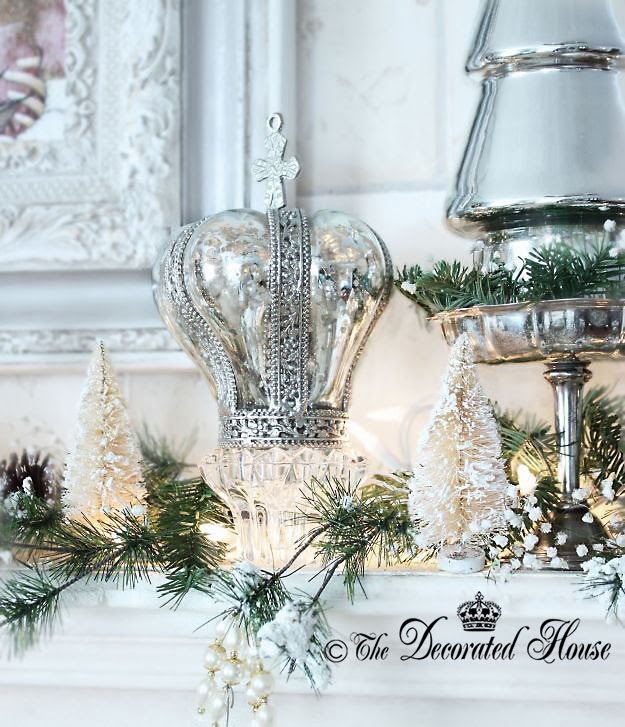 At the other end of the mantel is the sweet Mercury Glass crown. If I can find a way to work it into a holiday, it is displayed! This year it found the perfect spot on the mantel again. It sits on top of a crystal candle holder and next to another silvered tree with a star on top of it. 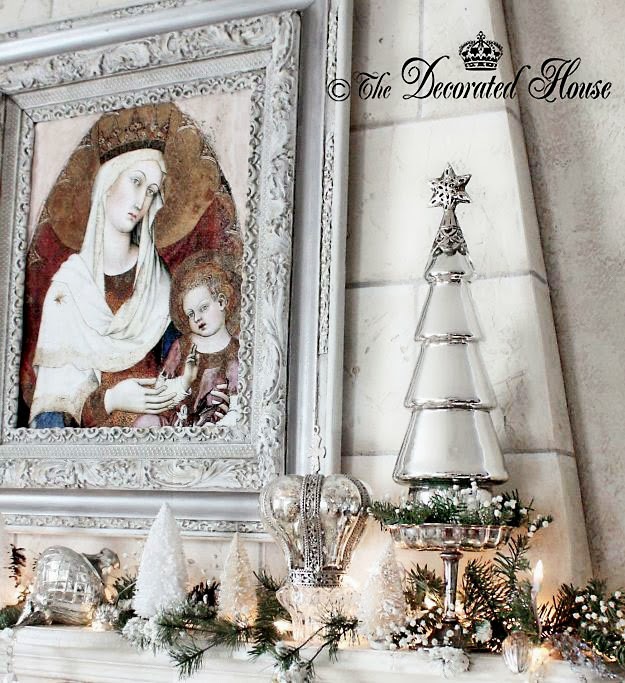 More bleached bottle brush trees with faux snow, and baby's breath completes this side of the mantel. Thank you for stopping by and sharing this holiday with me. Absolutely stunning. I love everything! Thanks for posting! Thank you for your lovely note. Merry Christmas! I hate to copy Robin, but "stunning" was the word that came to mind as soon as I saw your first picture, Donna! It all looks so beautiful. I love your mantel, too. It's fun to share another wonderful Christmas with you in BlogLand. Thank you and Merry Christmas! Hope all is well in your neck of the woods! Your mantle is a magical wonderland and I like how you used the Madonna and Child as your focal point. That looks great. Also your tree breathtaking! Wishing you lots of joy this season and always! It was so nice to see you and to stop by your place as well. As always, you are the sweetest. Merry Christmas! Wow Donna...your display and tree is absolutely spectacular! I love the white with the mercury glass. I am a silver freak so I just adore how this is all pulled together! Silver is so beautiful at Christmas time isn't it! You can see I love it too. Thanks for your lovely note. Merry Christmas! Love, love it! Do you remember where you got the crown. I collect mercury glass and I love crowns. The silvered Mercury glass crown came from Marshall's a few years ago. I haven't seen any since except one or two that showed up on the web as "vintage" and asking for much more than they sold for in the store. Thank you for stopping by. Merry Christmas! 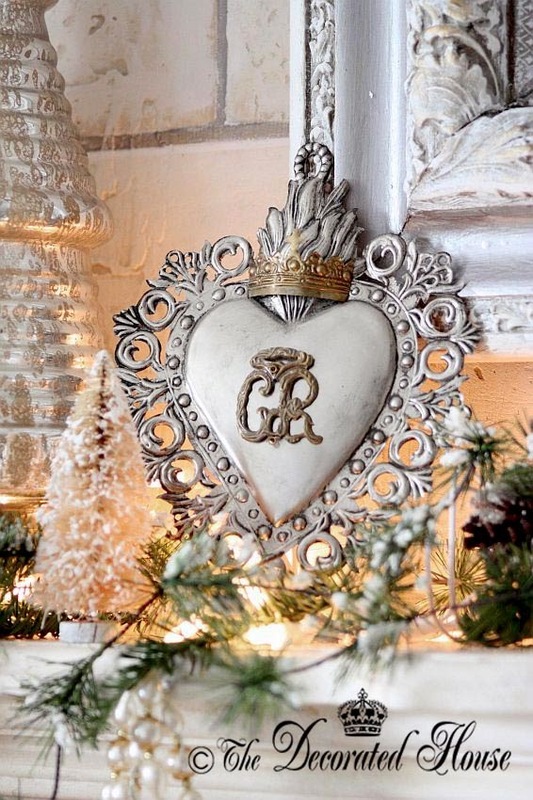 I love all the silver, mercury glass and white throughout your Christmas Tree and the Mantle!!! The Madonna and child print touches my very soul!!! The crown reminds me of the hymn, "Crown Him with Many Crowns"! So very nice to see you! As always, thank you for stopping by today and throughout the year leaving you warm and sweet notes. Merry Christmas! Oh, best use of French accessories for Christmas. This is gorgeous! Thank you for coming by. Merry Christmas! So so pretty Donna! 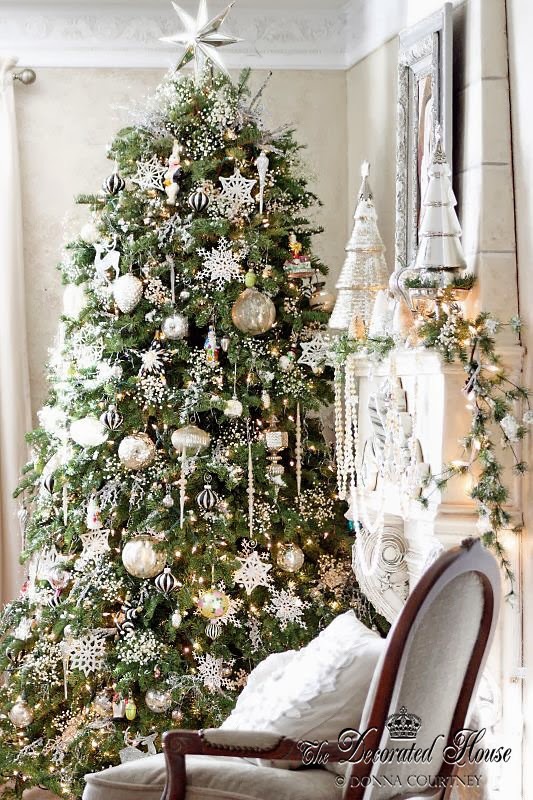 Your tree is just gorgeous - white/silver against the green of the tree is simply stunning! Merry Christmas to you! Thank you for stopping by.